By supporting donating to Wolf Connection in any of the many ways available you are directly helping us feed, train and provide medicine & veterinary care and a safe haven for our wolves as well as supporting our education and empowerment programs, changing the lives of countless at-risk youth in foster care, probation, expulsion schools, and drug and alcohol rehabilitation programs. By getting involved you become a true agent of change and hope– literally saving the lives of some of the most needed animals and kids … BRAVO!! 100% of your tax-deductible contribution goes directly to supporting the care of the wolves and the programs that make such a big difference for the youths who come in contact with them. 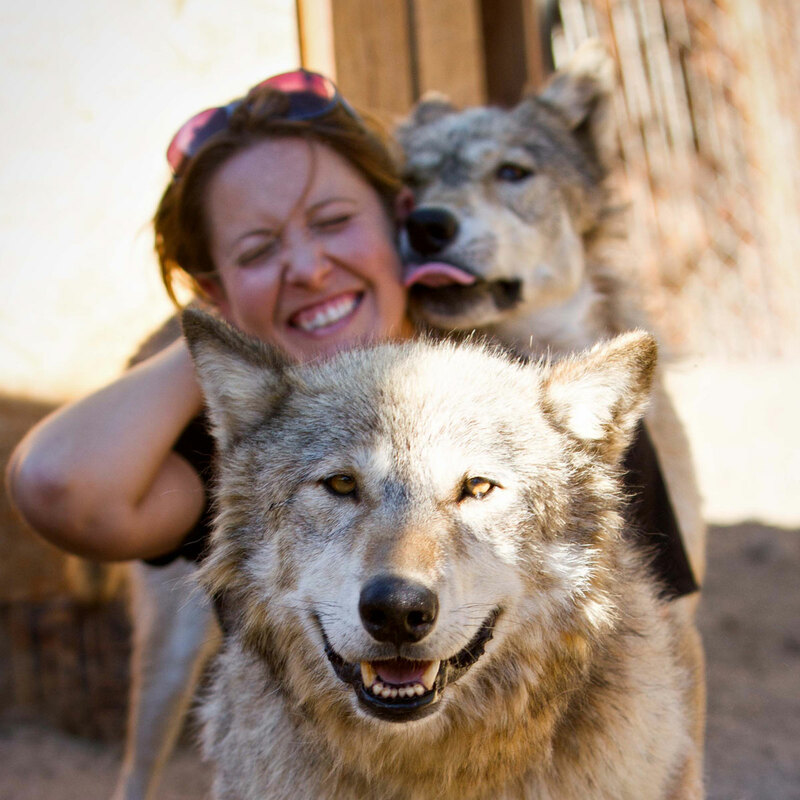 As a contributor and partner in this world-changing work you become an important member of our pack. At Wolf Connection we maximize your social investment dollars. Last year a renown foundation gave Wolf Connection a grant to fund the construction of our enrichment fields. The funds were supposed to fund 1200 feet of fencing. By working smart and negotiating with vendors, getting some materials and labor donated, we were able to build 2400 feet of fencing and purchase a much needed tractor to maintain the enrichment fields. Donate Online – make a one-time or recurring electronic gift by credit card (Visa, MasterCard, American Express, PayPal or Discover) through our secure website. Mail your gift to Wolf Connection, PO Box 504, Acton CA-93510. Please make check payable to Wolf Connection. Call Wolf Connection at (661) 450-8191 to discuss your major or planned gift with director Teo Alfero. Taking care of our animals is a daily commitment we make…24 hours a day, 365 days a year. With your help, we can impact their quality of life at every stage of their lives. They depend on us and your generosity to give them what they need to thrive so that we may continue to share their amazing stories with the community. Annual Gifts to Wolf Connection are the consistent resource we rely on to care for our animals, maintain the facilities, and provide a beautiful place our community can enjoy and our at-risk youth can learn and get ready to live a full life. Wolf rescue and rehabilitation: Every year thousands of wolves and wolfdogs are bred and sold as house pets in this country. The vast majority of those animals end up euthanized or in a rescue facility by the time they are three years old. If they are lucky, some of those animals come to live with us for life … some arrive in OK condition, some not so much, but our team of dedicated animal lovers will give them the best physical, psychological, and emotional rehabilitation treatment available and nourish them back to health and happiness no mater how long it takes … your contribution makes this process possible. To make an unrestricted Recurring Annual Gift please click here. You can never go wrong supporting a worthy organization that helps animals or children. At Wolf Connection we do both! Now, some trusting people may think that because they shared their noble intention to leave a portion of their estate to charity, or they wrote it down and signed it on a piece of paper they are keeping in their safe, their wishes will be respected and carried out once they transition into their next cycle of existence … we know however that is not always the case. If you are interested in planning for future bequests please make sure you take the necessary steps so that both your wishes and your loved ones are protected. At Wolf Connection we always advise to seek the advice of your legal counsel, financial planner or CPA. We will provide you with any information that your adviser may require. If you are considering a gift of any size and would like more information, please contact director Teo Alfero or call 661-450-8191. Thank you for your interest and support for Wolf Connection. The old saying “Someone else’s trash is another man’s treasure” is so true at Wolf Connection where we constantly need things that many people may have just laying around in their yard or taking up space in the garage. You can also purchase the items we need from Wolf Connection’s Amazon Wishlists! Click HERE for ANIMAL CARE products. Click HERE for products we need at OUR NEW FACILITY. Matching Gifts Matching gifts are company-donated contributions that match the contribution made by employees on a one-to-one, two-to-one, or even three-to-one basis. This program enables some donors to increase the impact of their contributions. For many donors, knowing that their gift can be doubled is a powerful incentive to give to Wolf Connection annually. Gifts of Securities Stock that has increased in value is one of the most popular assets used for charitable giving, once it has been held for a minimum of a year. Making a gift of securities to us offers you the chance to help our organization while realizing many important benefits for yourself. Closely-held Stock A donation of your closely-held stock can be a fine way for you to make a sizable charitable contribution while realizing valuable tax benefits. Wills/Bequests Learn how to help The Living Desert by using one of the most popular and simplest ways to make a gift. Memorials Discover a powerful way to make a gift to us in your name or in the name of a loved one while realizing tax benefits for your kindness. Planned Gifts Explore the value of charitable gifts that require a little thought, but pay off in big benefits to you, your family, and the many animals and youth you will be helping. Retirement Plan Assets Your financial future will likely revolve around your retirement plan assets. To maximize the value of a retirement account, consider making a lifetime gift of its after-tax values to a tax-exempt deferred giving plan. Savings Bonds Savings bonds represent major assets that may have stopped growing and are now collecting dust, just waiting to be put to use. A tax-wise use for your appreciated savings bonds is to support a cause you care about. Insurance Donating your life insurance could be a way to support our work. By making Wolf Connection the beneficiary of an existing policy you make good use of your resources and expand your ability to make a significant gift. Real Estate Using real estate, such as your house, farm, or commercial property to fund a gift allows you to preserve your cash assets, receive significant tax and income advantages, and make a larger charitable gift than anticipated. Give Your Home, but Live There for Life Make a gift to Wolf Connection of a remainder interest in your home, receive sizable tax benefits now and continue living in your home for the rest of your life. Charitable Remainder Trusts Under the right circumstances, this plan can increase your income, reduce your taxes, unlock appreciated investments, rid you of investment worries and ultimately provide very important support. Charitable Lead Trusts Make a donation now while reducing the tax burden for your heirs in the future. Donor Advised Funds Access the giving power of a private foundation without the expense or complexity.